Schumi0101: Ernakulam to Bangalore in KSRTC Club Class. Ernakulam to Bangalore in KSRTC Club Class. 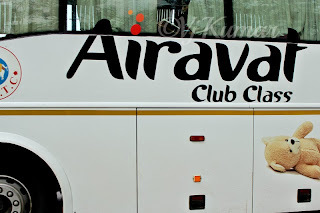 Service- KSRTC Airavath Club Class. This was my first trip to Ernakulam and the excitement was very high. I had consulted my friends from Kerala few weeks ago about operators yet deciding upon a specific operator was difficult choice because of my schedule. It was already 8:00pm, yet my friends were reluctant about me returning to Bangalore. However, with plans made up for the weekend, I packed up my bags and bid adieu to my friends and headed towards Vyttila Junction. As always my return journey was not planned and decided to try my luck by hunting for buses at Vyttila. My friend dropped me at the Vyttila Junction at 8:15pm and left immediately. My initial choice was SRM as I had heard a lot about the operator and its efficiency. However, spotting an Airavat B7R heading towards Mysore changed all the equation. Without further delay, I immediately called up Deepak, who was gave me the timings of Airavat Club Class from Ernakulam and Thiruvananthapuram. With time ticking by, I headed straight towards the enquiry counter at Vyttila and enquired about the bus. The person at the counter confirmed that all KSRTC buses heading towards Bangalore have left and was keen to sell me a seat on another operator. However, I decided to try my luck and waited at the junction. It was 9:20pm when a private operator heading towards Bangalore came at the junction and pulled over to pick up passengers. The travel agent saw me waiting and approached me and said I would wait the whole night with no avail as all the KSRTC Airavat buses had left. No sooner he finished speaking; the white elephant honked her way to the junction. The agent’s face flushed in embarrassment while I made my way towards the bus. My bus resting at Shantinagar, Bangalore. The bus was the 4pm Thiruvananthapuram-Bangalore service. The bus had around 5.16lac on the odos, the exteriors looked a little rugged but the interiors were very well maintained. The bus had 2 drivers who doubled as conductors. The bus was running late due to a new driver on the route. After picking up passengers at the bus stand, the bus moved on towards Edappally. Since the other driver was sleeping, I made my way to the font and took my ticket. With no conductor at the front, I decided to enjoy my favorite front seat ride with the driver. We quickly crossed Kalamassery and headed towards Chalakudy. The traffic was very thin as we cruised on the highway. We finally pulled out for the last break for the night before Chalakudy. The dinner break was not very short and it gave ample time for passengers to relax and prepare for the journey up ahead. After a 30minutes break, we moved on. While the passengers cuddled in their blankets for a peaceful sleep, I decided to stay with the driver to enjoy the journey upfront. The driver was very skilful and friendly. He ensured that his partner get ample rest and decided to drive the tricky stretch from Chalakudy to Coimbatore. We crossed Mannuthy but the traffic was high as we inched our way towards Palakkad. We decided to take a quick break here and both of us had a quick cup of tea and resumed our journey further. No sooner we crossed Kanjikode, the driver was a little worried about the traffic up ahead at the Walayar Checkpost. However to our surprise the traffic was less and we quickly passed through. We overtook Shama B9R and headed towards Coimbatore. We reached Coimbatore at 1:30am. The driver switch happened here and the new driver took over the wheels. I decided to keep him accompanied for sometime . We were nearing Avinashi when the brigade of B9R heading towards Kerala began. First up was the Kallada B9R’s followed by Kallada G4 followed by SRM. We headed a little further and we spotted Shama and another set of Kallada B9R, closely followed by KSRTC Mercs and B9R. We reached Erode in no time and made our way towards Salem. Here we spotted the mighty B11R of Kallada and right behind him was Kerala lines B9R. We dropped off few passengers in Salem and continued our journey. Finally, I decided to get some shut eyes and headed to my seat. It was 6:35am when I woke up and found we were near Krishnagiri. The bus had stopped for a break, however I decided to continue my sleep knowing that the journey would take a little longer than I anticipated. I remember passing by McDonald’s while I fell back into to sleep again. When I finally woke up, we were near Forum and the time was 7:45am. I noticed most of the passengers had got down en-route and there were around 5-8passengers in the bus. We were dropped off at Shantinagar Bus Stand at 8am. Needless to say but KSRTC is not amongst the fastest operator on this route, however if you are looking for a sedate, relaxed and comfortable journey, then KSRTC is the order for the day. 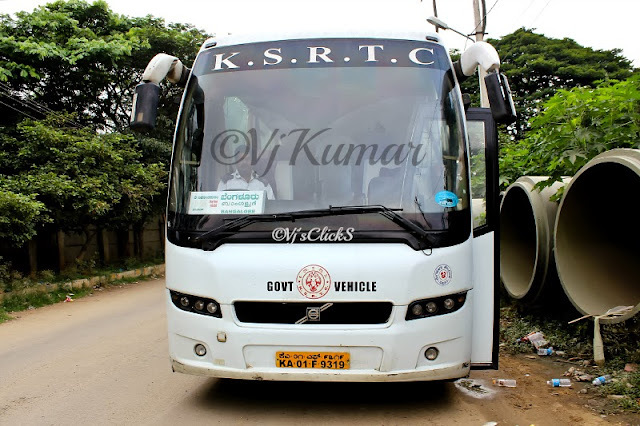 When I chose KSRTC, I knew I would not be reaching very early however; I did not want to miss the friendly and passenger friendly service of KSRTC. There are no words to describe the customer friendly crew I encountered in this bus who ensured that their passengers had a relaxed journey. If given an opportunity, I would definitely try this service again.